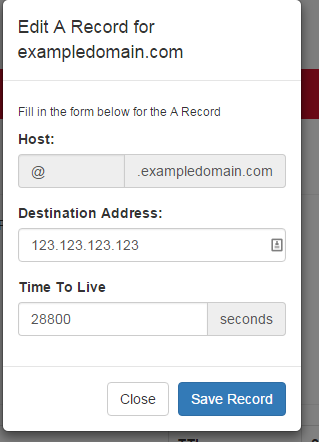 Here is where you can add DNS records to your domains. By default, the default record to add is an A record, to add records under another type, just click "Choose Record Type", then select the required record type. You can click on "Add x Record", depending on the type of record, you'll be presented with a pop-up with a few blank fields. TTL field: The units used are seconds. An older common TTL value for DNS was 86400 seconds, which is 24 hours. A TTL value of 86400 would mean that, if a DNS record was changed on the authoritative nameserver, DNS servers around the world could still be showing the old value from their cache for up to 24 hours after the change. Value field: CNAME Records are domain name aliases. Often computers on the Internet have multiple functions such as Web Server, FTP Server, Chat Server, etc.. To mask this, CNAME Records can be used, to give a single computer multiple names (aliases). Sometimes companies register multiple domain names for their brand-names but still wish to maintain a single website. In such cases, a CNAME Record maybe used to forward traffic to their actual website. Example: www.abc.in could be CNAME to www.abc.com. The most popular use of the CNAME Record, is to provide access to a Web Server using both the standard www.yourdomainname.com and yourdomainname.com (without the www). This is usually done by adding a CNAME Record for the www name pointing to the short name [while creating a CNAME Record for the shorter name (without www)]. CNAME Records can also be used when a computer or service needs to be renamed, to temporarily allow access through both the old and new name. Value field: An MX Record identifies the email server(s) responsible for a domain name. When sending an email to user@xyz.com, your email server must first looks up the MX Record for xyz.com to see which email server actually handles email for xyz.com (this could be mail.xyz.com or someone else's email server like mail.yourdomainname.com). Then it looks up the A Record for the email server to connect to its IP address. MX Priority field: Mail is delivered to the mail exchange server with the lowest preference number (highest priority), so the MX record you use for mail routing should have the lowest preference number, typically 0. For example, use 0 for your mail routing record, and 10 for the record for validating that you own your domain. Value field: TXT Records provide the ability to associate some text with a domain or a sub-domain. This text is meant to strictly provide information and has no functionality as such. A TXT Record can store upto 255 characters of free form text. This Record is generally used to convey information about the zone. Multiple TXT Records are permitted but their order is not necessarily retained. 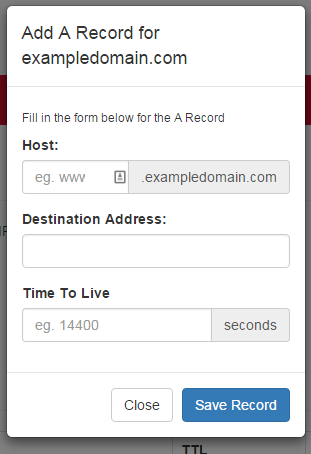 Example: You may add a TXT Record for yourdomainname.com with the value as This is my email server. Here, if anybody was checking the TXT Records of yourdomainname.com, would notice the above text appearing in the TXT Record. Sender Policy Framework (SPF): Sender Policy Framework is an extension to the Simple Mail Transfer Protocol (SMTP). SPF allows software to identify and reject forged addresses in the SMTP Mail From (Return-Path). SPF allows the owner of a domain to specify their mail sending policy, e.g. which mail servers they use to send mail from their domain name. The technology requires two sides to work in tandem: The domain owner publishes this information in an TXT Record in the domain's DNS zone, and when someone else's email server receives a message claiming to come from that domain, then the receiving server can check whether the message complies with the domain's stated policy. If, for example, the message comes from an unknown server, it can be considered a fake. Service Record Name field: The Service Record Name consists of the symbolic Service Name and the Protocol Name of the desired service. This is the symbolic name of the desired service. For example, chat, sip, etc. The protocol of the desired service, usually either TCP or UDP. Priority field: The priority of the target host. A lower value indicates higher priority. Weight field: A relative weight for Records with the same Priority. Port field: The TCP or UDP port on which the service is to be found. Target field: The canonical hostname of the machine providing the service. If the Server providing the service is managed by you, then you may set the Value in the format: service.yourdomainname.com. If you are using another Internet Service Provider's Server, then you need to enter a Fully Qualified Domain Name like service.isp.com. Note: A Fully Qualified Domain Name always has a "." in the end.